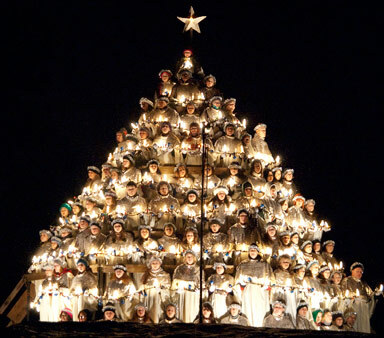 November 9, 2010: Belhaven University will present the 78th annual Singing Christmas Tree on December 3 & 4. Since 1933, Belhaven students have been donning robes and forming the shape of a tree to sing carols and celebrate the advent of Christmas. This is North Americas oldest outdoor annual concert of its kind. The tradition that attracts thousands each year was highlighted in the December 2008 issue of Southern Living magazine. It has been named one of the Top 20 Events for December 2010 by the Southeast Tourism Society. This is a family-friendly event, and attendees are encouraged to bring blankets and chairs. The event is set to begin at 7:30 p.m. on both Friday and Saturday night (December 3-4) in the Belhaven Soccer Bowl. Admission is free. Call 601-974-6494 for more information. Belhaven stands among the select Christian colleges and universities that offer a unique general core curriculum encouraging the development of a personal worldview. The university believes a Christian worldview is a key to preparing men and women academically and spiritually to serve Christ Jesus in their careers, in human relationships, and in the world of ideas. Founded in 1883, Belhaven University now serves over 3,000 students from campuses in Jackson, Memphis, Orlando, Houston, and online, offering traditional undergraduate degrees, graduate and adult degree programs, and online degree programs.